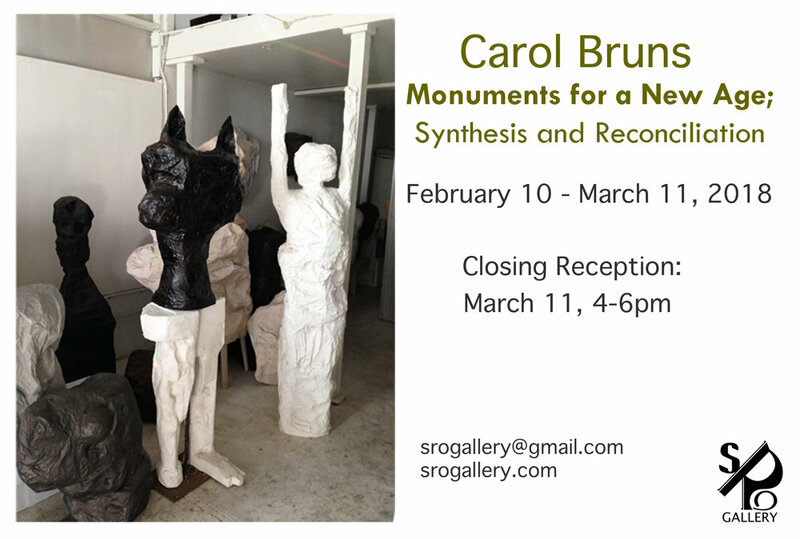 Carol Bruns’ current exhibit at SRO GALLERY exists within a synthesis between the organic and the abstract, allowing for a human-scale collaboration with nature. The special principals at work here feel like fragments of unknown political origin. Broken monuments hold discourse while bringing us to another order of complexity where balanced rock piles and constructivist principles merge. Notions of Stonehenge, reference feats of megalithic engineering. Like the archetypal import of Ana Mendieta's work, Bruns weaves layers of symbolism into an intricate matrix of meaning and personal revelation. The architectural presence, co-existing with something more relational, ignites dialogue to consider the symbiotic, the political, and what remains of expired empires. Bruns’ works on paper showcase a less airless primordial setting. Viewed as science or fiction, the collaged pages are a haunting view of the world and universe alive, interconnected and interdependent. 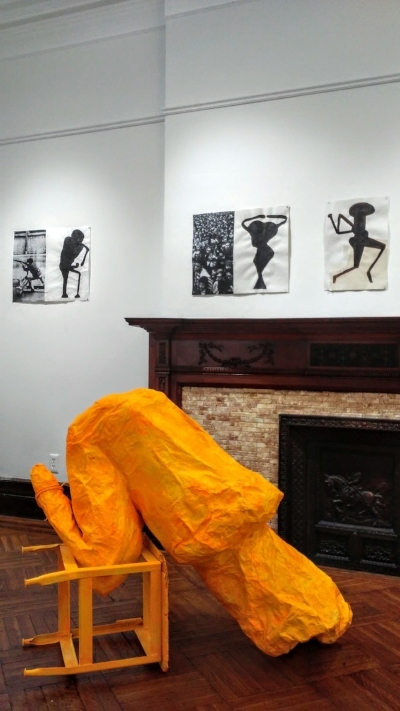 They are her personal mythology gleaned from the fragments of sourced publicity, news, and Kinsey Institute photographs, images her curiosity could not leave buried, with ink and brush additions. There is an intensity of interior meandering in Bruns’ ink work that echoes Hannah Hoch’s pictorial density and the enigmatic search for a myth. Bruns’ installation at SRO opens up a reflection of archetype as personal meaning in the spirit of play and free association. Collaged as figurative embodiments in an unlikely Paper Lamenate process Bruns has developed for her own use (involving sheets of paper with a rice paste the artist makes, which allows for organic shapes without the typical armature required for traditional papier mâché technique) and reworked to depict rearrangements, they evoke opportunity to redefine one’s course. As do her sculptures, Bruns’ paperworks, interact with one another. She believes we evolve within the constraints and the opportunities we create.